Just found this while looking through some 1956-1959 John Deere factory service bulletins. It is the proper procedure for adjusting the engine and steering clutch pressure plates for MC through 440 crawlers, and steering clutch on 1010. Procedure is different for 350, that procedure is posted below. I have this gauge for sale if anyone needs one. Last edited by Lavoy on Sat Nov 16, 2013 10:56 am, edited 1 time in total. Push on them with your hand, foot, pry bar, or whatever. It is such a pain to do, I usually do not worry about it. 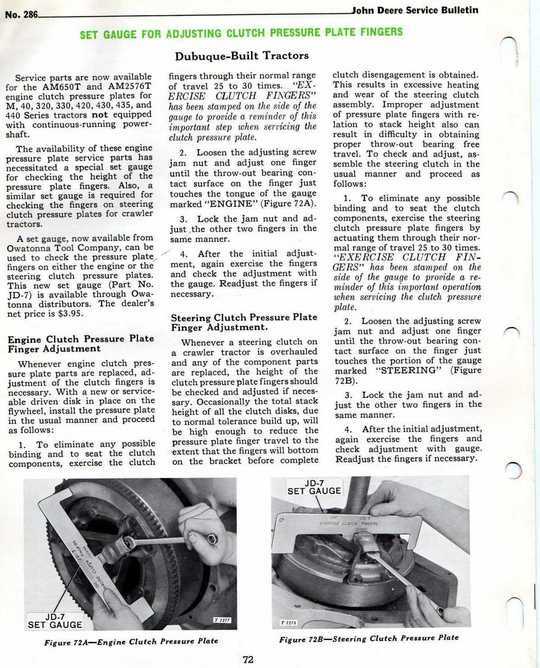 If you mean setting the pressure plate fingers, this info is the same. Thanks for the information. The left steering clutch on my 350 "may" have a problem. When your pushing with a full blade of dirt and the ole girl is scratching for everything she's got, the left track will stop turning and makes a growling sound. Do you think a steering adjustment will take care of it or is it more serious. If it's just a adjustment how much will you sell the gauge for? Thanks again. Keep in mind tha the gauge is to adjust the pressure plate when it is first installed on the final drive. The gauge is of no use once the final is installed on the crawler. $30 with shipping in US. Where can one purchase a Set gauge for Adjusting the clutch for JD 350 crawler? Just send me an e-mail or call. Lavoy, I have the steering clutch adjusting gauge from you for my 420, will the same gauge work on a 350 job I am about to start? Yes it does, you just use the tab hanging down in the middle. Yes I do, just call.